Bake: at 350F around 35 min. for 1 large loaf bake at 340F for about 45 min. Moc dobrý. Na druhé kynutí jsem těsto jen 3 krat preložil, udělal kouli a na plech kde jsem prostředek promacknul hloub než okraje. Žloutek, mandle 35 minute kynout a do trouby…nepukly a jsou vynikající. To je úžasný! Tak to mám radost! Moc dobry. Nejlepsi ze vsech co jsme pekla. Jee, tak to mám radost! I know elsewhere on this site, you said you have converted the recipes to US measures, but I live in the UK and would love to have the metric measures (grams etc) for this recipe if that is at all possible. Also, could I use beard flour in this recipe, instead of All Purpose? Hi Dave, I am creating my recipes using US measurements. I do have a conversion chart, which you can use. 🙂 http://www.czechcookbook.com/conversion-chart/ I think bread flour shouldn’t be a problem. I just never use it so I don’t have experiences with it. All I know it has more gluten. Wishing you success! many thanks for your help, that’s great. This recipe looks delicious, so I will give it a go, and let you know how I get on. že já si na Vás vzpomněla až po dvou neúspěšných pokusech!! Na třetí pokus – podle Vašeho videa a instrukcí – se mi ovšem podařily dva krásné zlatavé mazance. Bread flour will definitely work, however, for a sweet bread, a.p. flour will give a lighter texture to the bread. Also, keep the dough a little sticky, using only enough “bench flour” to manage shaping the dough. Thank you, Kristýna, for this recipe and for all your wonderful tutorials. 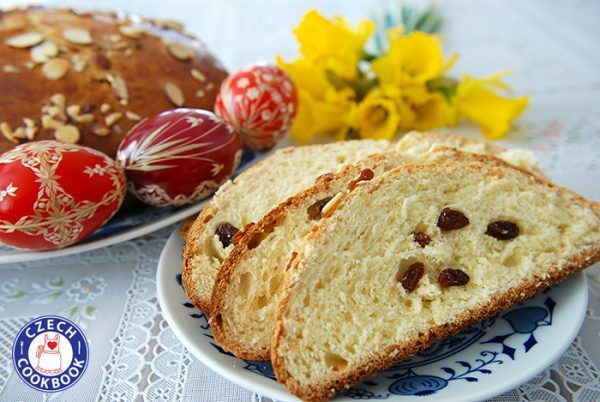 I am fifth generation Czech-American, and made Easter bread for the first time this weekend as a way to share my Czech heritage with my in-laws and maybe start a new tradition for my family. It was delicious and everyone enjoyed it.